Wow! What did we see last Monday night? Was Lando a temporary crewmember of the Ghost and aiding the Lothal Rebels? Amazing! And so as not to spoil it for those who are waiting for the complete series, the episode ended with the sure hope that Lando will make his way back on the galactic stage. In Lando we see a complex character who, as with all good businessmen/conmen, is well liked despite some of his actions. Because of him, some of us may have grown up knowing that friendships are tricky things. They rise and fall, get warmer or cooler. Sometimes there is a girl, a job or a hand of sabacc that gets in the way. But hopefully we always remember what that other person means to us. There may be betrayals or circumstances of life that cause us to drift from our friends, but something in the human being yearns for close friendships. Friends are with us in good times and bad. In times of need, we can turn to them and expect some comfort and aid. An inherent trust exists in all good friendships. Sometimes that trust is betrayed, but that betrayal only stings because we know what friendship is really all about. In a very precarious situation, Han Solo’s beloved Millennium Falcon is in need of hyperdrive repair and heads to his old friend Lando’s mining colony. There is a mixed reception on the landing platform when Lando teases Han with a chilly reception; though this eventually gives way to a warm embrace. I always wondered if this was a subtle warning from Lando to Han of the danger lurking inside. If it was, he didn’t catch it. Waiting inside is Darth Vader, Boba Fett and a host of stormtroopers. These are definitely not Han’s friends. And we know that there is also the grudge that Lando is harboring over losing the Millennium Falcon. So perhaps, even Han’s one time friend was in a cool mood as a result of the events that transpired between them. After the events on Cloud City were done, Luke was rescued by the crew of the Falcon, the frozen Han was on his way to Tatooine, and the group of rebels seemed scattered. But there is a resolve in their eyes that is palpable. The enemies have hurt the group, but are were more determined than ever to help each other. It is through their friendships and care for each other that, even in the face of recent setbacks, they believe that they will overcome the evil infecting the galaxy. For us, the value of friendship in our lives is great. And I don’t like using the word great when it is unnecessary. Human beings are not created to live for themselves alone, but as members of a community, where they find true personhood. We are communal beings and crave contact with other humans. Each does this in their own way. Some may prefer long periods of silence and solitude, but even that is done within a community, to a certain degree. From the dense cities of Philadelphia and Coruscant to the Jundland wastes and the American prairie, we are all surrounded by neighbors. In these communities and neighborhoods, we are stretched to become more than we would be if we were to be left to ourselves. So the next obvious question is: who is my neighbor? Who is valuable enough in my life that they are worthy of my attention, care and time? In the New Testament we have an answer to these questions that must have been shocking to the original audience. When a rich young man asked Jesus this very question, a straightforward answer was not given. But we hear the story about a guy who was waylaid by highway robbers. Kind of like Tusken Raiders. And of all the people who see him in his injured state, only the Samaritan stopped to help the injured man. The Samaritans were not well liked at that time. It was like saying that a kid from the bad side of town was helping, or a smuggler was sacrificing his time for the rebellion. The Samaritan binds the wounds and pays for the continuing care of the battered man. Jesus tells us that this is true neighborliness, and by extension, friendship. Friends are the ones who will stand by you in good times and bad. The word ‘neighbor’ itself comes from two Old English words. The first is ‘nēah’ which means near; and the second is ‘gebūr,’ which means dweller. To be a neighbor is to be near to someone. I know that I am speaking about two different things here – both friends and neighbors, but we will see how the neighbors are the ones that we ought to count as our friends in the end. We know from the parable of the Good Samaritan that the one who was truly neighbor to the attacked man was the Samaritan in his great compassion. Only the Samaritan was ‘near’ to the unfortunate man in his suffering. Jesus redefines ‘neighbor’ as more than just physical proximity, but also closeness in a spiritual and compassionate way. It is easier to ignore the homeless or the needy in our midst without giving them a second thought. However, it is our nearness and care that makes these two men from different worlds truly neighbors and friends. Within our Star Wars Fandom, we have a unique opportunity to create friendships and bonds with people of other like interests. There is a wide range of walks of life that are present in the fan community – full time writers, educators and medical professionals (and the random clergyman here and there). But there is something that is central that we can all agree on. Star Wars is awesome, and because of the connection we make through it, our lives are enriched in each other. It is my hope that our interest in the relationships of the Star Wars stories lead us to become better friends and neighbors in our own local places. To gain friendships with men and women who are near to us in our interests has the potential to make each of us, and the world around us, a better place. As I said to Jeff on his Podcast (yes, I’m shamelessly plugging you my dear friend.) Bantha Banter, “I don’t really have a lot of friends in the *physical sense*, in fact, I have a lot of friends that are *internet related* 🙂 The connection of Star Wars is an unbelievable phenomenon and it continues to amazes with each passing day. And you, my CWK related friend, have summed that up quite perfectly with this entry. There truly isn’t a better time than now to be a Star Wars Fan! When I hatche the plan in my head to start writing about Star Wars, I had no idea that it would open so many new friendships as well. I’m a bit different, more of the Will Rogers type: “A stranger is just a friend I haven’t met yet.” And I thrive and feel fulfilled with my friendships. So, it takes all types. Ironic that we can use a conman to show it to us. Thank you! 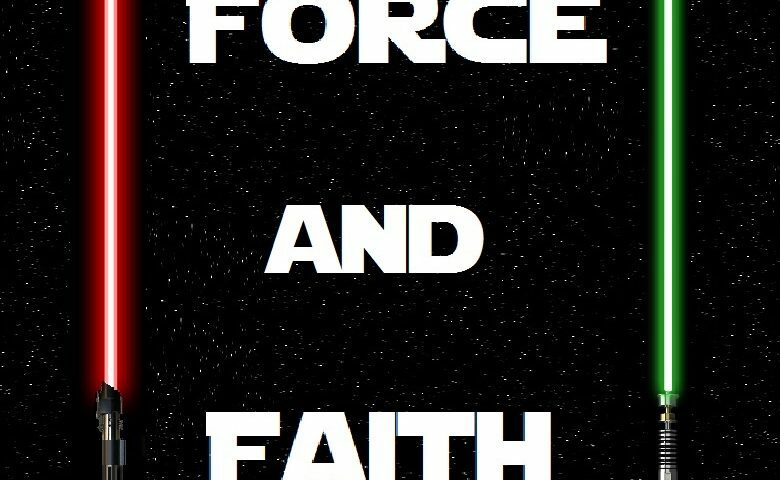 Read all of the blogs here and come back here next month for the Force and Faith! I’m late in responding because I was at a conference where I ran into some fellow workers I had not seen in 3 years – and we picked up with the warm relationships we forged at that time. So why did I wait? I’m not the sharpest marble out there.